WASHINGTON (May 04, 2015) -- The Army must be more selective and careful when choosing Soldiers to serve in key positions, such as recruiters or drill sergeants, said non-commissioned officers, or NCOs, at the first-ever NCO Solarium. Master Sgt. Danny Ibarra, 21st Theater Sustainment Command (Operations and Support), said the Army needs to do a better job of identifying and selecting Soldiers for key assignments. He said the Army has been embarrassed by recruiters having improper relationships with recruits, and even by an enlisted coordinator of a Sexual Harassment and Assault Response and Prevention program on Fort Hood, Texas, who was charged with sexual misconduct. Sgt. 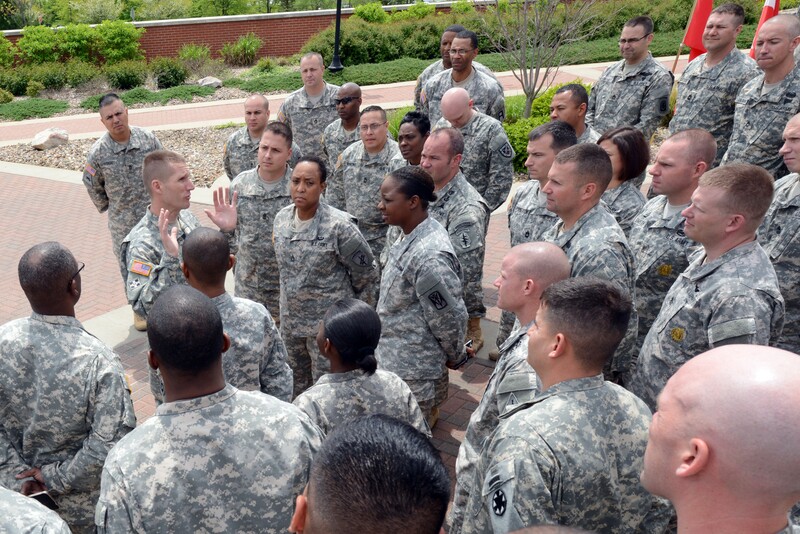 Maj. of the Army Daniel A. Dailey speaks with the 79 Soldiers, who participated in the first-ever 2015 Enlisted Solarium on Fort Leavenworth, Kan., May 1, 2015. "This isn't the first time these kinds of things have happened with these personnel," Ibarra said. "This was the first time they were caught. There may be others out there doing the same thing. How do we mitigate the problem of choosing the wrong people for serving in these assignments? We need to screen them better." Ibarra was the spokesperson for the "talent management" group during the 2015 NCO Solarium on Fort Leavenworth, Kansas. During the Solarium, about 80 NCOs from throughout the Army were tasked to come up with solutions to problems involving education, Army culture, training, mission command, physical fitness, and Army vision and branding. Those Soldiers were then asked to brief the sergeant major of the Army on their findings. Ibarra said there is not a standardized selection process for such key positions, and said that there needs to be involvement of the command sergeants major, or CSMs, and an interview process for such personnel such as what is done for first sergeants. "It may help us choose the best personnel for these positions," he said. "Having CSMs vet and interview these personnel could help stop putting the wrong people in these assignments." Ibarra's team has also recommended expansion of the Multi-Source Assessment and Feedback 360 program, "requiring all sergeants first class to participate in the program." He said if that program is expanded, it could also help CSMs conducting interviews for those key assignments, so those senior enlisted leaders could "see how junior Soldiers feel about these potential selectees." Sgt. 1st Class Bryant MacFarlane, 1/ARB (11D), also with the talent management group, said that his group also hoped the Army could do a better job of advertising career broadening assignments, assignments that he said affect the competitiveness of the enlisted force, and also prepare NCOs to be able to better bring important skills to their organization's leadership teams. MacFarlane said there is not enough knowledge throughout the Army about the availability of such assignments, and asked that there be an effort to better publicize those assignments. "We ask that somehow these sorts of assignments be broadcast, like an ask-like database, where I can self-nominate for these positions," he said. Sgt. Maj. of the Army Daniel A. Dailey said that the U.S. Army Training and Doctrine Command, also known as TRADOC, is working to better define what a broadening assignment is. He said Soldiers all have different interpretations. He said both experience and assignments can be broadening. He also said there are not a lot of those types of assignments available. An area of confusion, Dailey said, is the difference between what the Army might consider career broadening for Soldiers - jobs such as drill sergeant, recruiter, or Advanced Individual Training platoon sergeant - and what Soldiers might mean when they consider career-broadening assignments, such as fellowships outside the Army, with industry. Dailey said Soldiers are trained "first and foremost primarily to be able to accomplish their wartime mission on the battlefield." He said broadening assignments must serve both the Army and the Soldier. One career-broadening opportunity Dailey highlighted was the opportunity to participate in a fellowship on Capitol Hill. He said now the Army is putting sergeant majors into those positions. But Dailey said he believes that younger Soldiers could do the job, and both the Army and the Soldier would then be able to benefit from having them assigned to such fellowships. He said for older Soldiers, they are too late in their career for the Army to benefit. "If we are going to capitalize on these opportunities, we have to first access what is our intent for broadening," he said. "Why are we doing it?" Another opportunity, Dailey said, might be for a maintenance Soldier to work with a defense contractor that builds combat vehicles. But he said the Army must first determine what it is that both the Soldier and the Army get out of such an assignment, and what the Army should expect to get out of having a Soldier involved in such a non-traditional assignment. "TRADOC is working on that now," he said.